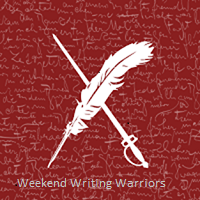 Welcome to the Weekend Writing Warrior blog hop where writers share an 8-10 sentence snippet of their writing, published or unpublished. My snippet this week comes from the first novella in a series of seven, Shattered Dreams. Drafts for #2 and #3 have been written. The last four plotted out. My plan is to start publishing them by the end of the year. What’s fun is that the characters come in and out of each other’s stories, as they should as one or both of the couples went to school together and all remain in the same community. Oh, and there is a 1969 Volkswagen Beetle that is pulled out of the lake in #1 with a mystery surrounding it. As a waitress, Shelley is in the diner’s freezer, having propped the door open with a brick. She stumbles, exclaiming out loud, and in the next instant, Mason is there beside her asking if she’s alright. She’s startled, bumping into him, which tips over a bucket of pickles that moves the brick, which seals them in darkness. Shelley chuckled, unable to help herself. So like Mason to joke when there was a problem. I love the sequence of events here and then the banter…great snippet! Feel you way . . . LOL! Pretty good in a crisis there guy! Of course, he sees it as an opportunity long overdue. At least they can stay warm (if she cooperates) and won’t starve before they’re discovered . . . not too soon, I hope! He not only jokes when there’s a problem, he flirts, too! This scene sound cute and funny . . . and perhaps soon-to-be romantic? Cute! I like him. A man who can laugh in a bad situation gets points from me. Good snippet. Thanks, Diane. I find myself chuckling every time I read their banter. Mason made me chuckle. Great snippet.